Coach Wayne Clark (head tennis pro at the MIRC) decided to put a twist on his Summer Tennis Camp program this year. He decided to introduce the kids to the sport of pickleball. Coach Wayne not only introduced pickleball at his camp at the MIRC but also introduced summer sports campers at Mackle Park to a weekly Tennis/Pickleball Clinic once a week. At Mackle each week, 12-15 enthusiastic kids participated in tennis & pickleball. 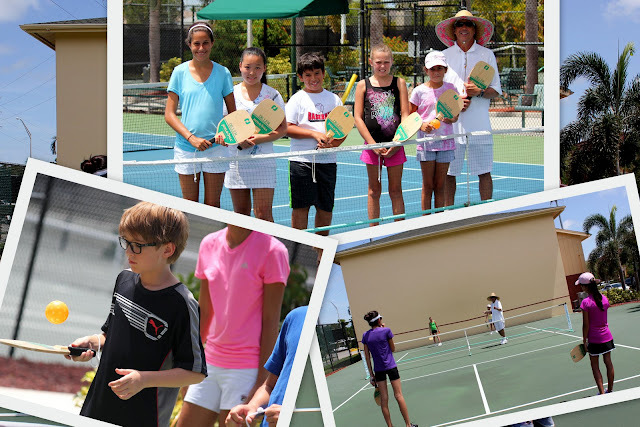 A total of 60 kids attended Coach Wayne’s Summer Tennis Camp at the Marco Island Racquet Center; an average of 8-12 kids per day during the 9 week program. Attendees included not only the regular locals but also included kids from Columbia, England, Germany, as well as kids from all across the USA. “I’ve had such a positive response and so much success with pickleball in my Summer Camp session that I plan on making it a regular activity in my City Kids after school programs,” remarks Coach Wayne Clark.